If you are looking for industrial or warehouse space for lease or sale in the Toronto area you may be wondering what market conditions are like. The basic narrative here is that it is an extremely tight market for space both if you are looking to lease or purchase a property. The vacancy rate in the GTA is currently at an all time low of about 1.5%. 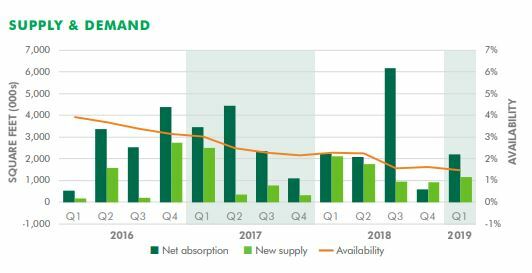 The average net asking rate for industrial space has increased for eight quarters in a row to a record high of $7.76 per square foot per annum. This is a 17.5 percent increase over last year. The situation is even much tighter if you are looking to purchase a property. For every 50 properties to lease there is probably only one available for sale. For the first time in the markets history the average sale price is over $200.00 per square foot and stands at $201.o8. Toronto has experienced strong employment gains and it is a very diversified economy. The city is growing as evidenced by a record number of cranes in the sky. Manufacturing has suffered but the demand for warehouse space for lease and sale in the GTA has exploded primarily due to the growth of e-commerce. New supply has not kept up with demand. This is partially due to the fact that the inventory for suitable development land has reached a tipping point. Land prices have reached record highs. There is very little available land in Toronto and other suburban markets such as Mississauga, Oakville, Vaughan, Markham and Richmond Hill that is suitable for building industrial property. The development industry is also relatively conservative and risk averse in the Toronto area especially compared to our counterparts in other US cities. The largest suburban industrial developer is Orlando Corporation. It has been difficult for other developers to compete on new major projects due to Orlando’s relative advantage in land costs. This has likely held back speculative construction by competing developers and slowed down the creation of new supply. The key to finding industrial space in this market is to become “real estate ready” This means to know what you need and to be educated on pricing and market conditions so that you can act quickly and confidently when the right property becomes available.